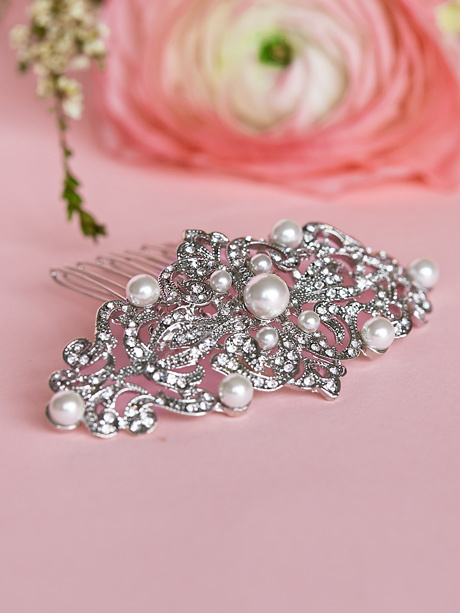 This hair comb is just so full of bling, it will compliment your hair style in a way you couldn’t image. I love this piece in gold as shown, can also be made in silver and rose gold. This gold crystal hair comb has some serious sparkle! with large marquise cut swarovski crystals thorough out to make a regal crystal pattern. Bling hair comb can be worn at the top of your veil, at the side or at the top of your hair style. The prongs can be easily bent so the feature beading is against the comb or facing upwards. Therefore the comb can be worn in more diverse ways. We have made matching earrings called the bling earrings. When you have a feature piece like this hair comb its best to keep the rest of your jewellery quite simple. Will come packaged in a black hello Lovers pouch and posted by overnight express post. Also, available in silver, email hello@hellolovers.com.au for more details.